The parathyroid glands are small endocrine glands located in the anterior neck. They are responsible for the production of parathyroid hormone (PTH). This article will consider the anatomical location, the different cells of the parathyroid gland, the actions of parathyroid hormone and the regulation of its secretion. Finally clinical diseases affecting the parathyroid glands will be discussed in detail. The parathyroid glands are located on the posterior, medial aspect of each lobe of the thyroid gland. Superior parathyroid glands – Derived embryologically from the fourth pharyngeal pouch. They are usually located at the level of the inferior border of the cricoid cartilage. Inferior parathyroid glands – Derived embryologically from the third pharyngeal pouch. They are usually located near the inferior poles of the thyroid gland. However in 1-5% of people they can be found deep in the superior mediastinum. 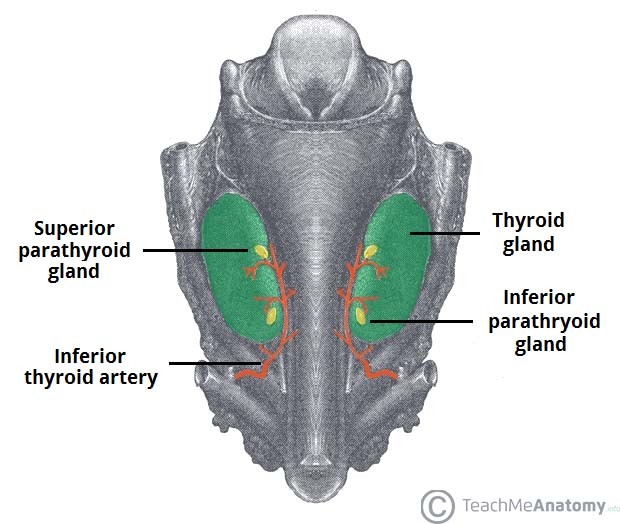 You can find more information on the anatomy of the Parathyroid gland here. There are two types of cells within the parathyroid gland, the chief cells and the oxyphil cells. Chief cells– The role of this cell type is to secrete parathyroid hormone. They contain prominent Golgi apparatus and endoplasmic reticulum to allow for the synthesis and secretion of parathyroid hormone. The chief cells are the smaller of the two cell types, however they are more abundant. Oxyphil cells– These cells are much larger but less abundant than chief cells. Their purpose is unknown. It is interesting to note however that the number of oxyphil cells increases with age and few are seen before puberty. Note that histologically fat cells (adipose cells) are also seen within the parathyroid gland. Fig 2 – Anatomical location of the Parathyroid glands and their histology. The synthesis of PTH begins within the rough endoplasmic reticulum, where pre-pro-PTH is produced. Pre-pro-PTH is 115 amino acids long and consists of a biologically active sequence, a C terminal fragment sequence, a pro sequence and a signal sequence. The signal sequence is cleaved within the lumen of the endoplasmic reticulum, leaving pro-PTH. After transfer to the Golgi apparatus the pro sequence is also cleaved, resulting in the production of mature PTH, which can then be stored in secretory granules for release. 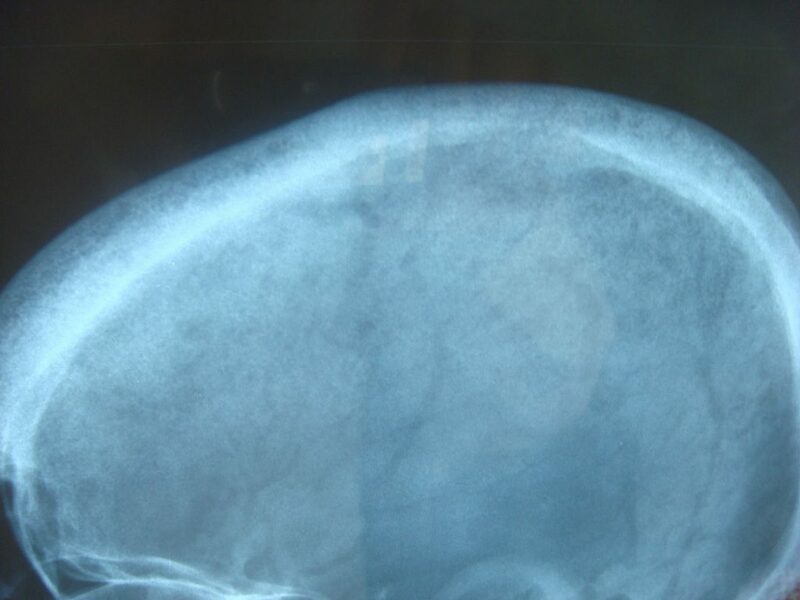 Increased bone resorption– PTH acts directly on bone to increase bone resorption. It induces cytokine secretion from osteoblasts that act on osteoclast cells to increase their activity. Osteoclasts are responsible for the breakdown of bone and thus an increase in their activity leads to increased bone break down. This leads to an increase in calcium in the extracellular fluid. Increased reabsorption in the kidney- PTH increases the amount of calcium absorbed from the Loop of Henle and distal tubules, however the mechanism is not fully understood. In addition to this PTH increases the rate of phosphate excretion which is very important to prevent to formation of calcium phosphate kidney stones. Vitamin D synthesis- Although PTH does not actively increase the absorption of calcium from the gut it stimulates the formation of vitamin D, this subsequently increases absorption from the gut. Like most endocrine organs the parathyroid gland is controlled by a negative feedback loop. Chief cells have a unique G-protein calcium receptor (CaR) on their surface, which regulates this. When calcium levels in the blood are elevated PTH production must be stopped in order to prevent further elevation of calcium which could lead to hypercalcaemia. Calcium binds to the G protein CaR which subsequently leads to the production of a molecule called phosphoinositide. The activation of this molecule prevents PTH secretion thus calcium is deposited back into the bones. Furthermore as mentioned above PTH stimulates vitamin D synthesis. Vitamin D also acts directly on the parathyroid gland to decrease the transcription of the PTH gene hence less PTH is synthesised. When Calcium is reduced the reverse occurs. Lowered calcium means reduced stimulation of CaR and decreased phosphoinositide. Subsequently PTH secretion is not inhibited. Decreased Vitamin D results in upregulation of PTH gene transcription thus more PTH is synthesised. Note: Elevated phosphate lowers free Calcium in the blood and inhibits the formation of Vitamin D.
Hyperparathyroidism is over-activity of the parathyroid glands and can be classed as primary, secondary, tertiary or malignant depending on the underlying cause. Primary hyperthyroidism is a result of direct alterations to the parathyroid gland such as a benign tumour, hyperplasia or very rarely parathyroid cancer. The excess secretion of PTH leads to elevated calcium in the blood which can cause signs of hypercalcaemia, osteoporosis, osteitis fibrosa cystica and hypertension. Secondary hyperparathyroidism is a physiologically elevated PTH due to reduced calcium levels. This could be caused by chronic renal failure or decreased vitamin D intake. Tertiary hyperparathyroidism occurs after prolonged secondary hyperparathyroidism. This is due to structural changes seen within the gland. To distinguish between secondary and tertiary hyperparathyroidism a blood test will be carried out. Elevated Calcium levels indicate tertiary hyperparathyroidism. Malignant hyperparathyroidism- some tumours, such as bronchial squamous cell carcinomas, produce a protein called Parathyroid related protein (PTHrP). PTHrP can mimic PTH due to the similarity in their structure which ultimately results in elevated calcium in the blood. However PTH will be reduced due to negative feedback to the parathyroid gland itself. Fig 3 – X-Ray showing the ‘Salt and Pepper’ sign commonly seen in hyperparathyroidism. It consists of multiple well-defined lucencies, caused by increased bone resorption. Hypoparathyroidism is underactivity of the parathyroid gland and can be classed as primary or secondary depending on the cause. Primary hypoparathyroidism is as a result of decreased PTH secretion due to gland failure. This results in symptoms of hypocalcaemia and patients will often need Calcium supplementation. Secondary hypoparathyroidism is commonly caused by surgical removal of the parathyroid glands. This is often accidental due to the fact that the inferior parathyroid glands are difficult to locate as mentioned above. Which cell-type, found in the parathyroid gland, secretes parathyroid hormone (PTH)? Which of the following is NOT a primary function of parathyroid hormone (PTH)? Which of the following types of hyperparathyroidism best describes a high plasma PTH concentration secondary to low plasma calcium concentrations? Which of the following is most likely to cause hypoparathyroidism?